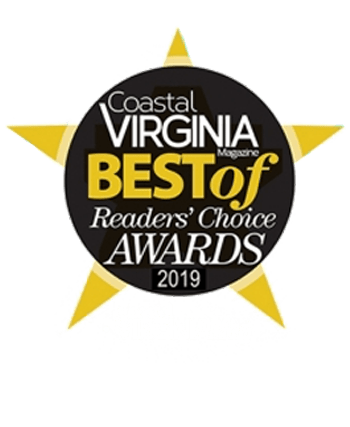 Nominated for Best Cosmetic Surgery Center by Coastal Virginia Magazine's Best of Readers Choice Awards. Discover how cosmetic surgery can lastingly take years off of your appearance. Time, gravity and perhaps a few too many calories may have gradually, but often noticeably changed our appearance. Plastic surgery may be the right choice for you to reverse the natural effects of aging. Not every solution to the effects of aging is a surgical solution. Learn about minimally invasive procedures that can easily solve issues like premature wrinkles, crows feet around the eyes or frown lines between the eyebrows. Do you feel y ou’re not living up to your fullest potential? At Plastic Surgery of Virginia Beach, we let you choose your destiny through our wide range of effective cosmetic procedures. Board-certified plastic surgeon Dr. Kevin Bounds is skilled at achieving natural-looking results for all procedures offered for the body and face. At Plastic Surgery of Virginia Beach, residents of Norfolk, Chesapeake, Newport News and surrounding communities in Virginia can achieve the look they’ve always desired. We invite you to learn more about Plastic Surgery of Virginia Beach, a leading plastic surgery center in the Virginia Beach area. Our practice offers the most advanced and complete cosmetic surgical services for those who wish to improve or refine their appearance. Under the direction of board-certified plastic surgeon Dr. Kevin Bounds, our staff delivers the highest level of plastic surgery care in the Virginia Beach area. We know that while it may be easy to find plastic surgeons, it is a lot more difficult to find one that truly meets your needs. At our practice, we are confident that you will find the care, compassion and understanding that you are looking for. We offer a wide array of procedures that can help you take years off your appearance, resulting in greater self-confidence and self-worth. We offer several plastic surgery procedures to shape and sculpt your physique. Dr. Bounds is specialized in performing male plastic surgery, which focuses on the needs of the modern man. At Plastic Surgery of Virginia Beach we also offer medical spa treatments for those who aren’t ready to go under the knife or who just need a little touch up using dermal fillers and injectables. Our team is pleased to offer the most current information and technology, as well as clinical excellence in aesthetic and reconstructive plastic surgery in Virginia Beach. Whether you’re considering full plastic surgery or just want a simple “refresh” with no downtime, our team is confident we can help you achieve your aesthetic goals. We understand that changing your appearance can be both exhilarating and overwhelming, which is why we specialize in effective treatments, compassionate care, and natural-looking results. Residents of Norfolk, Chesapeake, Newport News and surrounding communities in Virginia can trust board-certified plastic surgeon Dr. Kevin Bounds for all their plastic surgery and MedSpa needs. Contact us today to schedule your consultation. 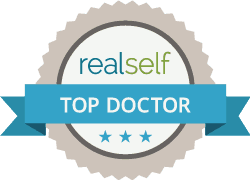 Dr. Bounds is my Doc of choice for cosmetic procedures. I have received Botox from others but since I have received his services, I have noticed the procedure lasts longer and with his knowledgeable placement of the injections, makes a big difference compared to the services I received elsewhere. I live in Hampton, but travel to Virginia Beach for his services - he provides value that is worth traveling for. Thanks Dr. Bounds! 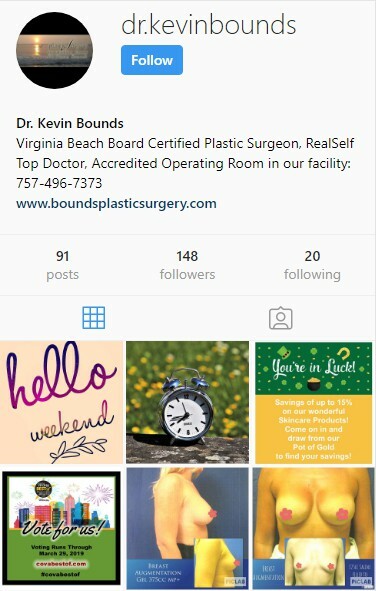 Robin M.
We invite you to learn more about the practice of Dr. Kevin Bounds, a leading plastic surgeon in the Virginia Beach area. Our practice is one of the most advanced and complete cosmetic surgical services for those who wish to improve or refine a facial or body feature. Under the direction of expert plastic surgeon Dr. Kevin Bounds, our staff delivers the highest level of plastic surgery care in the Virginia Beach area. We know that while it may be easy to find plastic surgeons, it is a lot more difficult to find one that truly meets your needs. At our practice, we are confident that you will find the care, compassion and understanding that you are looking for. 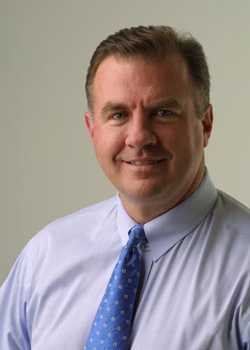 Dr. Bounds performs various types of breast surgery, including breast augmentation, breast lift, and breast reduction. His expertise includes various body surgeries such as abdominoplasty (tummy tuck) and liposuction as well as body sculpting. Looking years younger is easy to achieve with procedures such as eye lifts (blepharoplasty) and facelifts. All surgeries are performed by Dr. Bounds with the assistance of a licensed Anesthesiologist (physician) who provides sedation. Dr. Bounds also specializes in Non-Invasive and Minimally Invasive procedures such as BOTOX®, at his Virginia Beach plastic surgery practice. Our team is pleased to offer the most current information and technology, as well as clinical excellence in aesthetic & reconstructive plastic surgery in Virginia Beach.